Here's a technical look at five under-$10 stocks that look poised to trade higher from current levels. Just take a look at some of the big movers to the upside in the under-$10 complex from Wednesday, including Magellan Petroleum (MPET , which ripped higher by 29.8%; Walter Investment Management (WAC , which soared by 26.2%; International Tower Hill Mines (THM , which spiked higher by 17.5%; and Rocket Fuel (FUEL , which surged by 15.9%. You don't even have to catch the entire move in lower-priced stocks such as these to make outsized returns when trading. Low-priced stocks are something that I tweet about on a regular basis. These are also the exact type of stocks that I love to trade and alert to my subscribers in real-time. I frequently flag high-probability setups, breakout candidates and low-priced stocks that are acting technically bullish. I like to hunt for low-priced stocks that are showing bullish price and volume trends, since that increases the probability of those stocks heading higher. These setups often produce monster moves higher in very short time frames. With that in mind, here's a look at several under-$10 stocks that look poised to trade higher from current levels. One under-$10 clinical-stage biopharmaceutical player that's starting to move within range of triggering a big breakout trade is Tobira Therapeutics (TBRA , which focuses on the development and commercialization of therapeutics to treat liver disease, inflammation, fibrosis and HIV. This stock has been smashed lower by the sellers over the last six months, with shares off sharply by 42.4%. 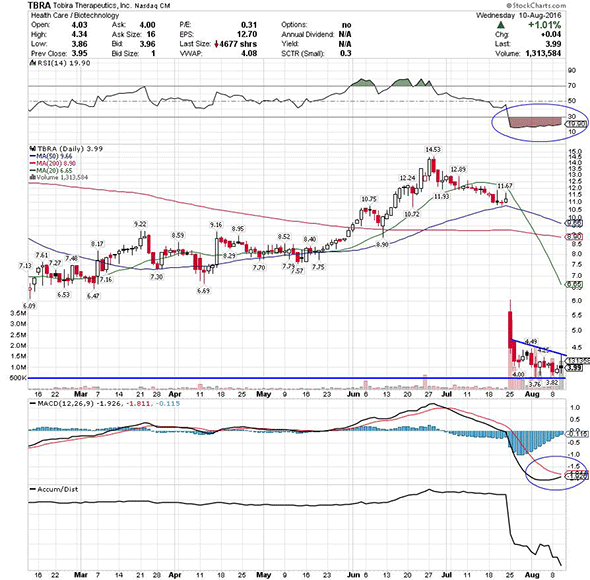 If you take a glance at the chart for Tobira Therapeutics, you'll notice that this stock recently gapped-down sharply lower from $11.67 a share to under $4.50 a share with heavy downside volume flows. Following that move, shares of Tobira Therapeutics continued to slide lower with the stock printing a new 52-week low of $3.76 a share. That being said, this stock trended modestly higher on Wednesday right above some near-term support levels at $3.76 to $3.82 a share with strong upside volume flows. Volume for that trading session registered over 1.31 million shares, which is well above its three-month average action of 259,981 a shares. This high-volume bump to the upside is now quickly pushing this stock within range of triggering a big breakout trade. Market players should now look for long-biased trades in shares of Tobira Therapeutics if it manages to break out above some near-term overhead resistance levels at $4.34 to $4.50 a share and then above more key resistance at $4.70 a share with high volume. Look for a sustained move or close above those levels with volume that registers near or above its three-month average action of 259,981 shares. If that breakout materializes soon, then this stock will set up to re-test or possibly take out its next major overhead resistance level at its gap-down-day high from late July near $6 a share. Any high-volume move above $6 will then give this stock a chance to make a run at $6.50 to $7 a share. Traders can look to buy this stock off weakness to anticipate that breakout and simply use a stop that sits right below some key near-term support levels at $3.82 to its new 52-week low of $3.76 a share. One can also buy shares of Tobira Therapeutics off strength once it starts to clear those breakout levels with volume and then simply use a stop that sits a comfortable percentage from your entry point. Another under-$10 energy player that's starting to trend within range of triggering a near-term breakout trade is Synergy Resources (SYRG , which engages in the acquisition, development, exploitation, exploration and production of oil and natural gas properties primarily located in the Denver-Julesburg Basin in Colorado. This stock has been in play with the bulls over the last six months, with shares trending higher by 18.2%. If you take a look at the chart for Synergy Resources, you'll notice that this stock spiked sharply higher on Wednesday back above its 20-day moving average of $6.41 a share and right into its 50-day moving average of $6.62 a share with strong upside volume flows. Volume for that trading session registered over 5.40 million shares, which is just above its three-month average action of 5.10 million shares. This high-volume rip to the upside is now quickly pushing shares of Synergy Resources within range of triggering a near-term breakout trade above some key overhead resistance levels. Market players should now look for long-biased trades in Synergy Resources if it manages to break out above its 50-day moving average of $6.62 a share and then once it takes out more near-term overhead resistance levels at $6.74 to $6.82 a share with high volume. Look for a sustained move or close above those levels with volume that registers near or above its three-month average action of 5.10 million shares. If that breakout develops soon, then this stock will set up to re-test or possibly take out its next major overhead resistance levels at $7.18 to $7.50, or even its 200-day moving average of $7.63 to $8.70 a share. Traders can look to buy this stock off weakness to anticipate that breakout and simply use a stop that sits right below some near-term support levels at $6 to $5.90 a share, or around more key support at $5.60 a share. One can also buy shares of Synergy Resources off strength once it starts to take out those breakout levels with volume and then simply use a stop that sits a comfortable percentage from your entry point. 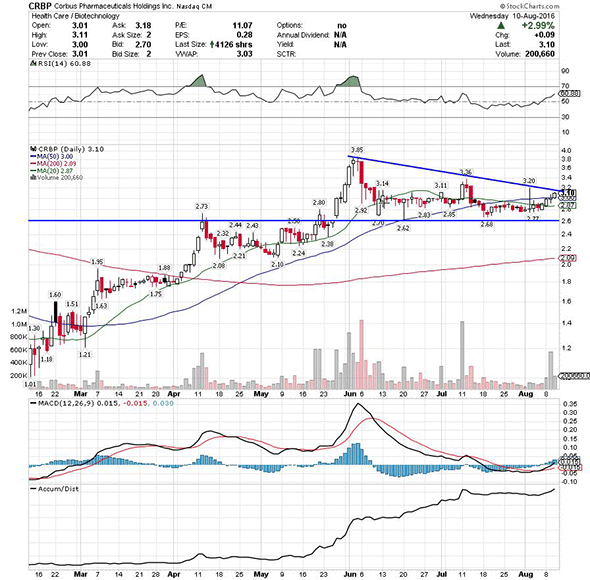 One under-$10 clinical-stage pharmaceutical player that's starting to trend within range of triggering a big breakout trade is Corbus Pharmaceuticals (CRBP - Get Report) , which focuses on the development and commercialization of novel therapeutics to treat inflammatory and fibrotic diseases. This stock has been red hot over the last six months, with shares exploding higher by 195.2%. If you take a glance at the chart for Corbus Pharmaceuticals, you'll notice that this stock recently formed a double bottom chart pattern, after shares found some buying interest at $2.68 to $2.77 a share. Following that potential bottom, this stock has now started to trend higher back above both its 20-day moving average of $2.87 a share and its 50-day moving average of $3 a share. That trend has now pushed shares of Corbus Pharmaceuticals within range of triggering a big breakout trade above some key overhead resistance levels. Traders should now look for long-biased trades in Corbus Pharmaceuticals if it manages to break out above some near-term overhead resistance levels at $3.20 to $3.36 a share with volume that hits near or above its three-month average action of 233,941 shares. If that breakout fires off soon, then this stock will set up to re-test or possibly take out its next major overhead resistance levels at $3.85 to its 52-week high of $4.22 a share, or even $4.31 to its all-time high of $4.95 a share. Traders can look to buy this stock off weakness to anticipate that breakout and simply use a stop that sits right below its 20-day moving average of $2.87 a share or near those recent double bottom support levels. One can also buy shares of Corbus Pharmaceuticals off strength once it starts to clear those breakout levels with volume and then simply use a stop that sits a comfortable percentage from your entry point. Another under-$10 shipping player that's starting to rip within range of triggering a big breakout trade is Navigator Holdings (NVGS - Get Report) , which owns and operates a fleet of liquefied gas carriers worldwide. This stock has been hit hard by the sellers over the last six months, with shares falling sharply by 35.9%. If you look at the chart for Navigator Holdings, you'll notice that this stock recently gapped-down sharply lower from $9.70 a share to just above $8 a share with heavy downside volume flows. Following that move, this stock went on to print a new 52-week low of $8 a share on Wednesday, before reversing that move and closing near the highs of the day with strong upside volume flows. Volume on Wednesday registered over 810,000 shares, which is well above its three-month average action of 357,138 shares. This high-volume spike is now quickly pushing shares of Navigator Holdings within range of triggering a big breakout trade. Market players should now look for long-biased trades in Navigator Holdings if it manages to break out above Wednesday's intraday high of $8.80 a share and then once it clears its recent gap-down-day high of $9.10 a share with high volume. Look for a sustained move or close above those levels with volume that registers near or above its three-month average action of 357,138 shares. If that breakout takes hold soon, then this stock will set up to re-fill some of its previous gap-down-day zone that started at $9.70 a share. Any high-volume move above $9.70 will then give this stock a chance to tag its next major overhead resistance levels at $10.50 to around $11 a share. Traders can look to buy Navigator Holdings off weakness to anticipate that breakout and simply use a stop that sits right below its new 52-week low of $8 a share. One can also buy this stock off strength once it starts to bust above those breakout levels with volume and then simply use a stop that sits a comfortable percentage from your entry point. 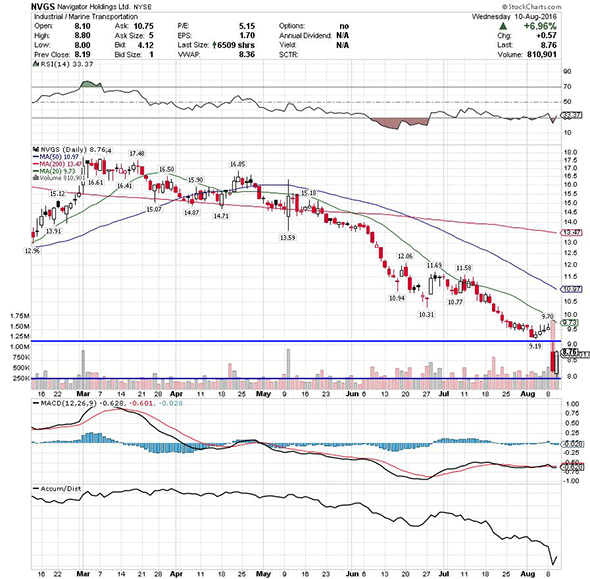 One final under-$10 credit services player that's starting to spike within range of triggering a major breakout trade is LendingClub (LC - Get Report) , which operates as an online marketplace that connects borrowers and investors in the U.S. This stock has been smacked lower by the bears over the last six months, with shares off sharply by 24.5%. If you take a glance at the chart for LendingClub, you'll notice that this stock trended modestly higher on Wednesday right off both its 50-day moving average of $4.57 a share and its 20-day moving average of $4.61 a share with decent upside volume flows. This stock has also been uptrending a bit over the last two months, with shares moving higher off its low of $4.03 a share to its recent high of $4.99 a share. 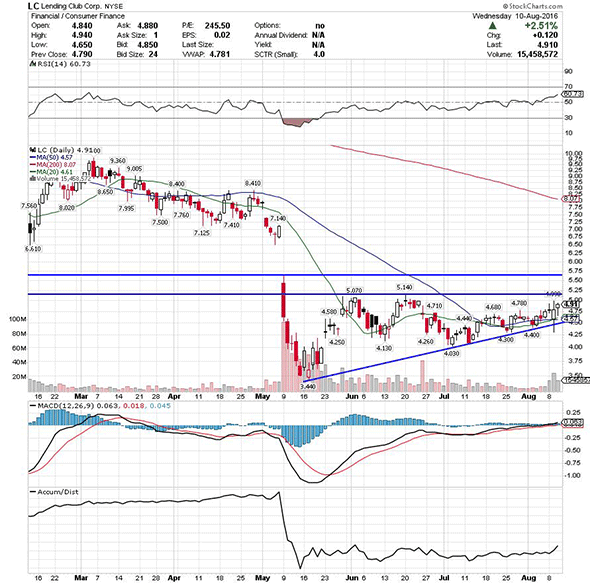 That uptrend and subsequent move to the upside on Wednesday is now quickly pushing shares of LendingClub within range of triggering a major breakout trade above some key overhead resistance levels. Traders should now look for long-biased trades in LendingClub if it manages to break out above some near-term overhead resistance levels at $4.99 to $5.14 a share and then above its gap-down-day high from May at around $5.75 a share with high volume. Look for a sustained move or close above those levels with volume that hits near or above its three-month average action of 17.25 million shares. If that breakout kicks off soon, then this stock will set up to re-fill some of its previous gap-down-day zone from May that started near $7.14 a share. Traders can look to buy shares of LendingClub off weakness to anticipate that breakout and simply use a stop that sits right around some key near-term support levels at $4.25 to $4.03 a share. One can also buy this stock off strength once it starts to trend above those breakout levels with volume and then simply use a stop that sits a comfortable percentage from your entry point. Disclosure: This article is commentary by an independent contributor. At the time of publication, the author was long TBRA.